I'm a news junky. Radio, including short wave radio, used to be my primary source of world news. As the internet ramped up in the '90s I used to visit a bunch of sites each morning to get my update on what's important to me. It took maybe 15 minutes, while eating breakfast, to read the sites. I also appreciated their design, sometimes clicked deeper in to their content and viewed their banner ads. Now I use RSS readers, it used to be NetNewsWire but now that web apps are getting good, I use GoogleReader. I can skim all the headlines in seconds, view a bit more info a few more seconds and drill right to the site if I want more very quickly. Content is king and it's a great deal but I do feel bad that the sites I read every day (actually many times a day) don't get the benefit of my ad impressions. Some sites are smart, or manipulative - if you like. 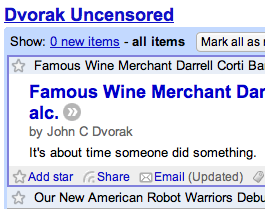 The king of traffic manipulation is John C Dvorak. I like his story sense - he's been around a long time reviewing technology, so he's a skeptic and tends to dismiss the hype around new product announcements which is actually a useful approach. John has a rather broken RSS feed that gives you just the headline, which is often incomprehensible without the image. If you click through, you get the comments about the story, but not the story. So you are forced to go and visit the home page. He's getting several page views through this strategy. Dvorak and his (new) team of hhopper, Eideard, Uncle Dave, SN, and Gasparrini don't seem to publish any original content on the blog (presumably that's saved for commercial journalism outlets that pay a bit better). The value they are adding is mostly editorial - they find interesting stories and re-publish a bit, often embedding video segments. They always give attribution and links - so that's good for the original content creators. The big secret in the news business used to be how much of the news (90%?) was simply copied or slightly edited from the wire services: AP, Reuters, etc. It's no longer a secret to anyone who views GoogleNews and sees how the same story appears, word for word, in all the world's news papers. Opinion - interpreting a bunch of stories to deliver some insight about "what's really going on"
The scary thing is how much of these are able to be done pretty well by automated computer programs. I love news, but right now the only people being paid by me is my internet provider. This doesn't seem quite fair.